Gilder Lehrman Collection #: GLC04522.11 Author/Creator: Bailey, Isham G. (fl. 1867) Place Written: Marshall County, Miss. Type: Document signed Date: 1 January 1867 Pagination: 2p. ; docket : 30 x 19 cm. Summary of Content: Signed by Isham G. Bailey and by Cooper Hughs and Charles Roberts, with their marks; countersigned by Justice of the Peace A.B. Conly. In addition to Hughes and Roberts, their family members are also bound by the contract to work on the farm. Their responsibilities include the cultivation of forty acres of corn and twenty of cotton, helping to put up fences, and doing all the work necessary to keep the farm in good working order. They are to receive half of the cotton and one third of the corn and fodder raised for their services. Roberts and his wife further agree to do housework for Bailey in return for fifty dollars. 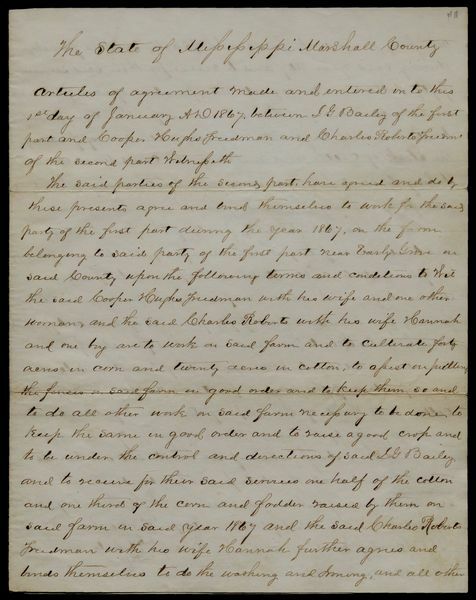 Bailey agrees to provide the necessary mules and farming tools to cultivate the crops, furnish the Hughes family with 550 pounds of meat for the year and the Roberts family with 487 pounds of meat for the year. Bailey also agrees to give the Hughes and Roberts half of the cotton crop and one third of the corn crop cultivated during the year. With 5-cent revenue stamp.